When I had my eye infection I was asked to take a picture of myself with my nice little eye patch and post it on Facebook. Well of course it was going to end up being a layout! *okie is beginning to think she scraps some of the most stupid stuff* I am sure my friend Linda will get a kick out of this one since she wanted me to make a layout kit to take to the Swarm. 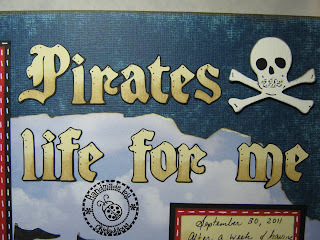 I actually had to use the Gypsy on this one because I was wanting to use Blackletter cartridge for the title because it just looked piratey *okie thinks she sure is making up a lot of words lately*. I used the Liquid Walnut ink on the bottom of the letters to give the lettering an aged look. Click the picture if you would like to see closer detail of the effect the ink gives. On the cloud paper I tore across and then burned the edge. I used Cat Eye Chalk ink in Popcorn on the waves to make them look like they had white caps. The "sand" was crumpled and then sanded. I blacked out some of the pieces to make the trunk have a wood base and then "metal" top layer. The lock was colored with a silver gel pen. I also had to do some work in Design Studio to get the ship to have a wooden look base and then the white sails. I did have to hand cut the eye patch and then just used a black marker for the "string". You guys know I am never very happy with the things I do but I really like how this layout turned out. I just wish it would have had a better "picture subject"! OMG, this is one of your best layout yet!!! Awesome! Sorry for your eye infection. Hope it's all cleared up now. Thanks for giving us the details on the tearing, burning, inking, crumpling, sanding and gypsy-ing. It goes in my creative techniques file for future use! You did lots of detail work on this and it shows. I think the 'picture subject' looks very nice - it's a cute photo of you... and the layout is awesome! 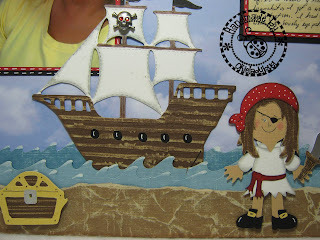 My daughter hosts a pirate party each year on "talk like a pirate day" and this would make a great layout for a photo of her. Quite fetching with that eye patch - you're a super pirate! The LO is darling, thanks for sharing. Arrrrgh, Matey! 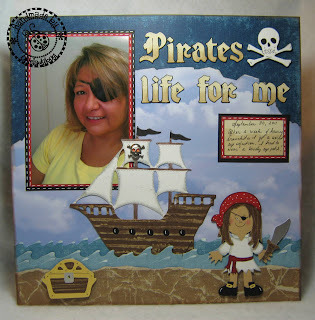 Good pirate layout! lol! Very clever and very nicely done! Love, Love, Love, the layout and your picture is so CUTE!!!! Great job on the layout Okie!! At least something good came out of having the eye infection!! Hope it's all healed by now. I agree, I think this is my favorite layout you have done. This is soo cute! 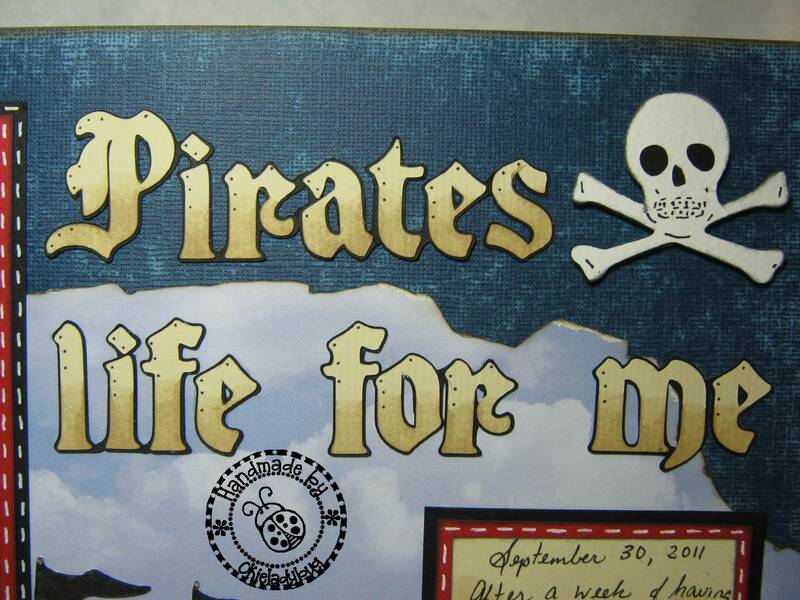 I just might have to scraplift some of it....My youngest grandchild was a "pirate" for halloween and I wanted to scrap his picture...just didn't know where to start. Thanks for sharing your knowledge and artistic projects! That's so cute! TFS!--Pat N.